We are currently attempting to ensure that all families have both accurate and adequate emergency contact information in our system, and communications notification preferences set as desired. Please click here to read these important instructions. If you anticipate that your student will not be returning to Bacich Elementary School or Kent Middle School next year for any reason, please contact the school office. kik Auction Event tickets now on sale here. Colonial Day for fifth grade students. Sixth Grade Bike Skills Class in P.E. Friday, May 3, 2019: Bacich Earth Day – volunteer here to help with lunchtime activities between 11:30 a.m.-1:30 p.m.
Click here to read Superintendent's Liz Schott's thoughts on the KSPTA's new standing committee on equity and inclusion. Learn how classes for next year's school year are formed and how you may provide information on your student regarding the process in Bacich Principal Sally Peck's weekly letter. Author Lisa Papp will visit Bacich Elementary School to talk to students about her new book, Madeline Finn and the Shelter Dog. Bacich Author Visit Madeline Finn Order Form - Download the book order and personalization form and return it to the Bacich Library by April 5, 2019. Be sure to say you are from Bacich to receive a percentage of your sale donated to Bacich. View flyer. Bacich Open House – April 4, 2019, 6-7:30 p.m.
Volunteer here to help with lunchtime activities between 11:30 a.m.-1:30 p.m.
Next Meeting: May 6, 2019, 3-4 p.m., Bacich Library. All parents are welcome to attend. Read Kent Principal Grant Althouse's letter about the new Open Session program that will be a part of Advisory classes in his weekly letter. We encourage you all to read Jerry Craft’s amazing graphic novel New Kid. Come to the library for a copy or borrow one from your language arts teacher. You may also borrow a copy from the public library. Then, join us on April 25, 2019 at lunch in Room 24 (Mrs. Gallagher’s room) to eat pizza and snacks and talk about the book. View Kent Daily Announcement on Kent website. Yearbook Are Now On Sale! Don't miss out on this important memento for your Falcon! Just go to this link: www.yearbookordercenter.com. Our school code is 7587. Save the date! May 2, 2019 – Second Annual Kent and Book Passage Event. The evening will feature student performances including our Kent band, as well as summer reading recommendations and shopping to benefit our school! Hope to see you there! Our Change for Change drive is in full swing! Time to clean out those couches, coat pockets, and coin jars! We are collecting change, by house, to benefit the JFCS's Refugee Resettlement Program. This is a real world connection to our all school reading of Refugee by Alan Gratz to help refugees like Isabel, Josef, and Mahmoud right here in our own area. Refugees in the Bay Area need our help and the JFCS will help ensure that our change will help to change the lives of others. Collection jars are located in room 34. Thank you for helping to build a better world! Sign Up Here to participate in the new community service initiative. Tickets are being sold for the annual Kent Raffle to raise funds for 8th grade graduation. Through April 19, 2019, raffle tickets will be available for sale in each quad during morning recess! We will raffle off $500 cash, AirPods, Gotts gift certificate, a Guest Star spot on Wednesday Broadcast, and a one gallon candy jar! Tickets are $5 each or 5 for $20. The winners will be drawn on April 19, 2019. Please submit an email with the names of all of the children in the photos in the subject line of your email and also in the email body text. Please send no more than 3 photos in the highest resolution possible to: 8thgraderphotos@gmail.com. Photos are due April 15, 2019. 8th Grade Moms Event Fundraiser – April 18, 2019, 6:30 p.m.
Purchase raffle tickets at the event, or or via PayPal link – $10/ticket or 6 for $50. Visit Safe Routes to School for Walk & Roll information, safety tips in English and Spanish, neighborhood safe route maps, and public bus to Kent information. Tickets are now on sale for the A Night in Hollywood Spring Event on May 11, 2019! Join us for dinner, dancing, amazing live and silent auction items, and sign up parties! You are invited to an evening of music, massage, tasty treats, refreshments, and casual boutique shopping. Join the San Rafael Parent Community for the final WeAreSR! Parent Education Event of the year. Know how to come to an agreement on a family drug and alcohol plan. The goal of this talk is to share accurate information about teenage substance use and misuse and tools to support a meaningful family conversation around this topic. Led by Marin-based Psychotherapist and Success Coach, Heather Johnson, LMFT. Free to all parents and their teenage children. Presented in English with simultaneous translation to Spanish. SchoolLink: Buy Books! Help Schools! Shop at Book Passage, mention your school, and your school will receive a percentage of purchases back as a donation. Camp Galileo is supporting Kentfield Schools PTA in April! Camp Galileo is back at Kent June 24 through August 9, 2019. Throughout the month of April, Galileo will donate $25 to Kentfield Schools PTA for every family that enrolls at Camp Galileo (K-5 grades) or Galileo Summer Quest (5-8 grades at Edna Maguire, Mill Valley). Plus, you’ll get $50 off camp with code 2019SCHOOLREWARDS. Be sure to enter Bacich Elementary or Kent Middle School as the school during checkout (in the camper info section). Have fun this summer and support our PTA! Learn more at galileo-camps.com or 800-854-3684. Boys and girls born 2001-2013. View flyer in English and Spanish. XR Super Girls: A Free Empowerment Workshop for female middle school, high school, college students, and beyond. Teachers are also welcome. XR Super Girls is aimed to encourage female students to engage in academic and career pathways in STEAM, emerging tech, digital design, computer programming, immersive storytelling, new media, and entrepreneurship through the awesome potential of Extended Reality (XR): Virtual Reality, Augmented Reality, and 360-Video Immersive Storytelling. Top women industry leaders and entrepreneurs in XR will inspire and lead small group mentoring and coaching sessions to help students and attendees identify their talents, dependable strengths, and unique “super powers” to bring to the new worlds of XR: Virtual Reality, Augmented Reality, and 360-Degree Immersive Narrative. This event is free for students ages 13+ and $20 for attendees. Space is limited! Wednesday, April 24, 2019, 7-8 p.m., for grades 4 and up. We are reading The Watsons Go to Birmingham by Christopher Paul Curtis. Call 415-924-3515 to sign up and reserve a copy of the book! 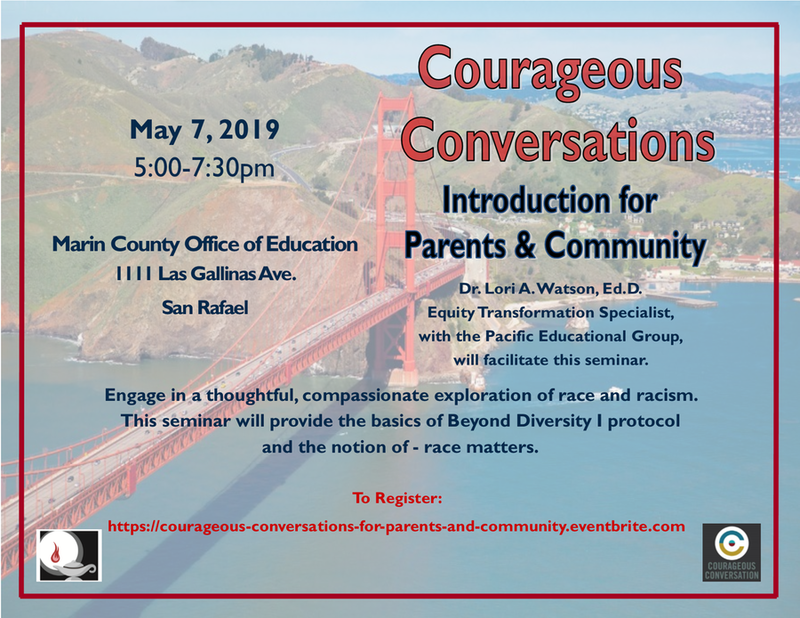 Engage in a thoughtful, compassionate exploration of race and racism led by Dr. Lori Watson, a transformation specialist with Pacific Education Group who has been working with educators across Marin’s public and private schools to look intensely, both personally and professionally, at race, racism, and how we are educating all students. Spanish language translation will be available during the meeting.